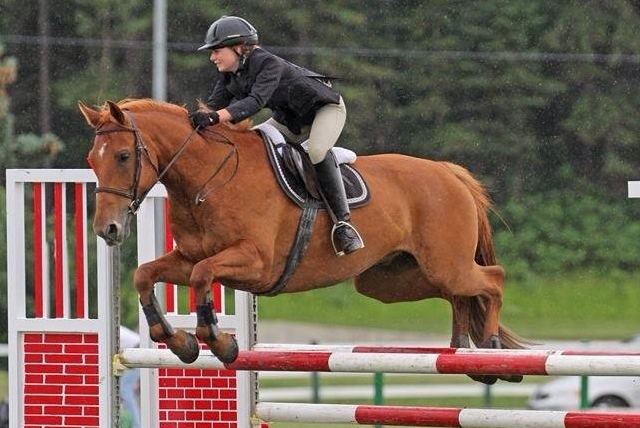 Smoky River Sport Horses is a family based business located in Bezanson, approximately 30 minutes east of Grande Prairie, Alberta near the beautiful Smoky River Banks. We have been breeding and raising horses for over 40 years, using our natural location as the perfect place for training and breeding quality horses. Our horses are mainly pasture raised where they have lots of room to roam, play, and get daily exercise and lots of natural grazing. This we believe also contributes to development of our horses right from foals all the way to being mature horses. They get they the ideal amount of exercise to properly develop bone, ligaments, muscles and strength while still growing and maturing. This will positively impact their development and helps with long term soundness and durability. For generations our family has used horses under saddle and in harness for work, competition, or pleasure. We have put extensive time and miles on our horses resulting in well-trained horses that have been exposed to a vast variety of tasks, obstacles and challenging terrain. It become obvious early on, that only the best type of horses (horses with superior endurance, soundness, and stamina, along with willing temperaments and courageous nature) could handle this type of work. This invaluable training and these attributes go a long way toward producing successful competition horses. We have continued and furthered our goals by adding top bred horses with tremendous athletic ability and proven bloodlines to our breeding program. 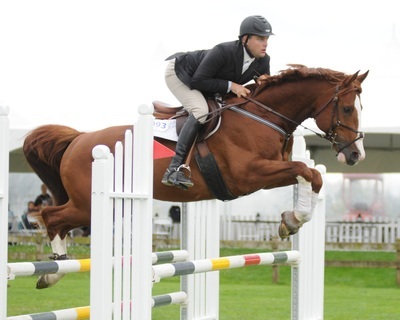 We now also have many of our other horses out competing on the circuits and winning and placing on many levels all across North America , Spruce Meadows, as well as locally. We look forward to getting many more to their future homes and bright futures! Shown Above : Alyssa (left) on Whiskey, and Kayla LaValley (right) on Wage. Some of our crew while competing "A" circuit shows with their Smoky River Sport Horses! Nabella shown above was purchased by our farm several years ago. (barn name BELLA) She is a successful Grand Prix showjumping mare herself and was originally imported from Germany. 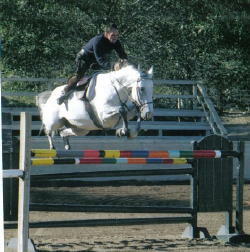 Nabella has proven that she has her own impressive jumping talent, but also has famous linage. Bella is sister to the famous Grand Prix Showjumper “Shutterfly”.Shutterfly rode by Meredith Beerbaum, a successful international showjumper and ranked as the Top Show Jumping Horse world wide in 2005. 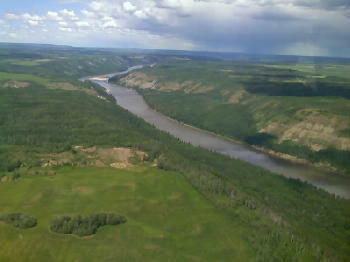 Aerial picture of some of our farm where we raise our horses. 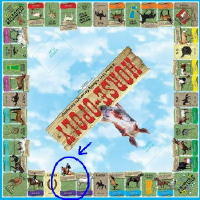 We are honored to have our Trakehner Stallion Donnerval (Shown being rode by family member Arne LaValley) was selected to be featured on the Horse-opoly Board game version of Monopoly to represent the Trakehner breed. 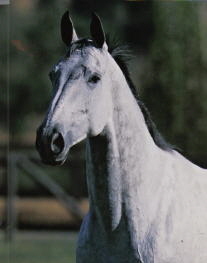 He was one of our stallions we trained and stood as a stallion on our farm. We are delighted to have much of his intelligence, athletics and trainability in many of our current bloodlines and performance horses. 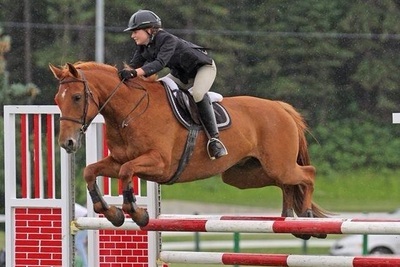 Tobruk shown above (now sold) and with lessor Carlie (junior rider) recently went to ALBERTA YOUNG RIDERS DRESSAGE SHOW. Carile did all FEI level tests at the FEI Children’s and got Qualifying marks needed to Qualify for the Nationals. Also shown featured on cover of CTHS publication magazine. Tobruk competed in the FEI LEVEL children’s Provincials and Nationals. Our CW Stallion Valero - at Thunderbird Horse ShowShown being Rode by Jean-Francois. 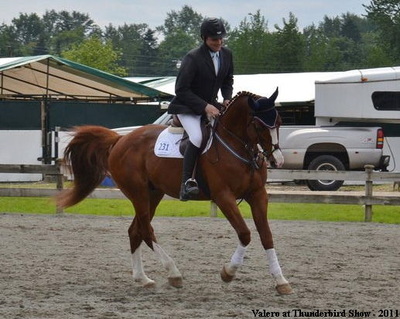 Valero in Summer 2011 took some time off from his breeding duties to go show and compete at some bigger shows in BC. Valero also has offspring available for purchase. While looking for a new horse I had a few things I really wanted, I was starting to become a little "picky" because alot of the horses I was looking at were not matching my criteria. I wanted a big, strong bay gelding for dressage and show jumping, it doesn't sound that hard to find but I was becoming a little frustrated because I couldn't find exactly that, until I came across an ad for Smoky River Sport Horses stating "17.1hh Stallion Warmblood". I contacted Brandy right away to see if he was still for sale when she replied yes I knew I had to jump on the opportunity to own the horse of my dreams. I knew I didn't want a stallion and I had a limit on what I could afford. Brandy was very helpful and patient, she worked out a great deal on Valegro and also had him gelded for me. When I saw Valegro for the first time I was very impressed by his movement and his calm, pleasing temperment. The LaValley family is very welcoming and they really try to help you find what you are looking for in a horse. They take great pride in the horses they breed and sell. He impresses me more and more everyday. He has amazing conformation, and his abaility to learn is fascinating. You show him something once and it clicks with him. Even with his size he is very focused on me and what I am asking him to do. I dont think I could have found a more amazing horse that fits my ability so perfect. Valegro is everything I wanted and more. I am very grateful i got to meet the LaValley family and had the chance to own one of their horses. 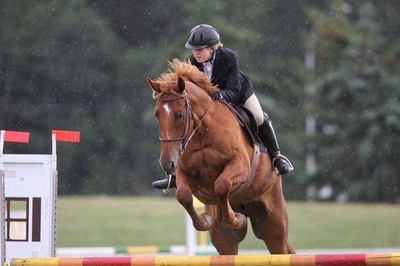 I recommend them to anyone who is looking for a quality show or pleasure horse. Thank you so much Brandy & the rest of the LaValley family for your help in shipping and in finding the most perfect horse!! Thank you so much Smoky River Sport Horses. I spent months trying horses throughout Western Canada only to be disappointed time after time. Frustrated with the whole process, I was about ready to give up when you replied to my email request and encouraged me to come out and try some horses. I spent the 9 hour trip getting ready to come home again without a horse...I was so wrong! Your horses were everything advertised and more, with steady minds, solid foundation in riding and wonderful work ethics. It was a pleasure to stay with the LaValley family and be among excellent horsemen and women, enjoying arena and outdoor rides in a beautiful setting as I made my decision. My 12 year old daughter had been riding for years and was now ready for a new horse to match her ability. We looked and looked for a long time and could not find anything to suit our needs and were becoming quit frustrated. 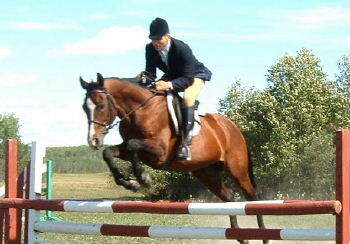 We wanted a fairly young horse, big and athletic, and yet had some decent training. We thought we were not going to find anything until we stumbled upon an ad for Smoky River Sport Horses and one horse in particular caught my daughters eye. So we headed to the Smoky River Farm thinking this would probably be another futile trip. BOY were we wrong! We were immediately welcomed as part of the family. We spent 4 days there riding and trying horses and being looked after by the LaValley family. I truly felt that I was dealing with people who I could trust and were committed to providing us with a great horse. 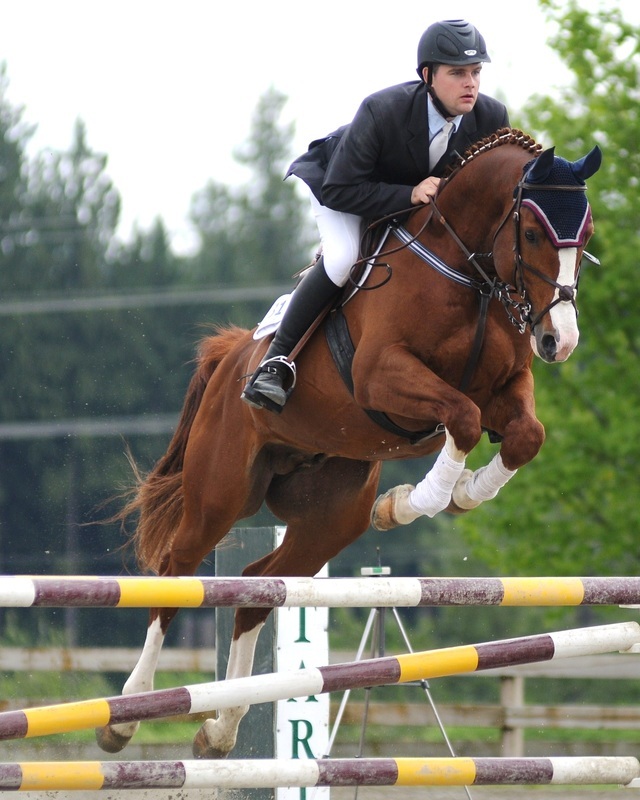 As a professional rider and trainer, I have had a lot of experience with the buying and selling of horses. I have never been more impressed with the overall experience I garnered from Smoky River Sport Horses and the people there. From the very beginning, I was greeted with respect and kindness, and special attention was taken care that the horse I was looking for was going to be the best possible match for the rider. Not only are they extremely careful about the quality of horse they provide, but that the horse is going to work out as well as it can. Any questions I had were answered honestly and openly, and all information provided for me, including abundant pictures and video clips. My daughter had always dreamed of having a horse, thus began the adventure looking for a suitable horse. Our journey took us to many breeders, then finally we met Brandy and Arne. With just a few questions they were quickly able to determine my daughter’s vision of a perfect horse and at the same time they were able to assess her riding capabilities. Arne and Brandy took extra care so that that horse and rider are suited for each other. Their family was so patient as we were trying to decide on a horse. Any questions I had were answered honestly and openly.